The House approved the Electricity Reliability and Forest Protection Act, H.R. 1873, by a vote of 300 to 118. The bill was introduced in the House in April by Representative Doug LaMalfa (R-CA), and sought to make it easier for electric co-ops to secure permits to control vegetative overgrowth and trees that could damage power lines on federal lines. It would also hold federal agencies liable if they deny permission to manage vegetation that then causes a fire. McClintock referred to the 2013 wildfires in In La Pine, Oregon, caused when a dying tree fell on a powerline. Requests from Midstate Electric Cooperative for permission to trim trees threatening its power lines were refused by the Forestry Service. Damages from the resulting wildfires cost over $300,000 – and were paid ultimately by every household served by Midstate. H.R. 1873 basically does two things. 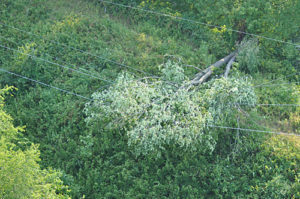 It provides utilities with the ability to rapidly remove hazardous trees by receiving pre-approval from the Forest Service to manage transmission line right of ways and remove trees that are or could become hazards; such projects are exempted from time-consuming and costly environmental reviews. Furthermore, if a utility requests authorization to remove a tree and is denied by the Forest Service, the Forest Service is responsible for any firefighting costs that result from the failure to remove the tree – not the utility and its customers. The second bill of importance to electric utilities is H.R. 1551, sponsored by Representative Tom Rice (R-SC) in March, which would eliminate the 2020 construction deadline for new nuclear power plants to be eligible for production tax credits established in 2005. The legislation would also allow qualified “public entities” – including public power utilities and rural electric cooperatives – to transfer the value of the advanced nuclear tax credit to for-profit entities participating in the project, including, for example, mining companies supplying fuel. In a June letter to Ways and Means Committee Chairman Kevin Brady, R-Texas, and Rep. Richard Neal, the top Democrat on the committee, the American Public Power Association urged the committee to approve the bill. Joining the Association in signing the letter were the Edison Electric Institute, the Nuclear Energy Institute, the National Rural Electric Cooperative Association, and the Large Public Power Council.